Keeping up to date on the latest commercial roof ventilation products could save your company on electricity costs, increase employee safety and a more pleasant work environmental. This is why we have yet again updated our popular commercial ventilation alternatives chart. Companies from the 2015 Commercial & Industrial Roof Ventilation Alternatives Chart have been improving on their effectiveness and becoming more competitive with price. Proper roof ventilation and or commercial heat extraction is necessary, especially in commercial situations with heat, gases or fumes. 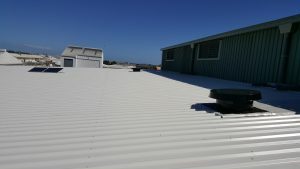 Commercial ventilation is the key to a comfortable work environment and can be used in many large areas for shed ventilation, office ventilation, warehouse ventilation, etc, so have a look at these recent roof ventilation alternatives and see what works best for you and your space. 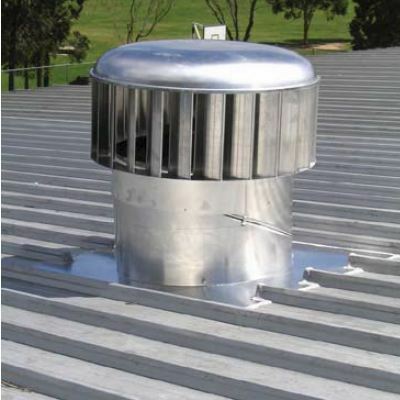 Air flow is the key piece of information to assess to find your most suitable commercial ventilation roof ventilator. This tell you in cubic metres per hour how much air your commercial exhaust fan will ventilate. 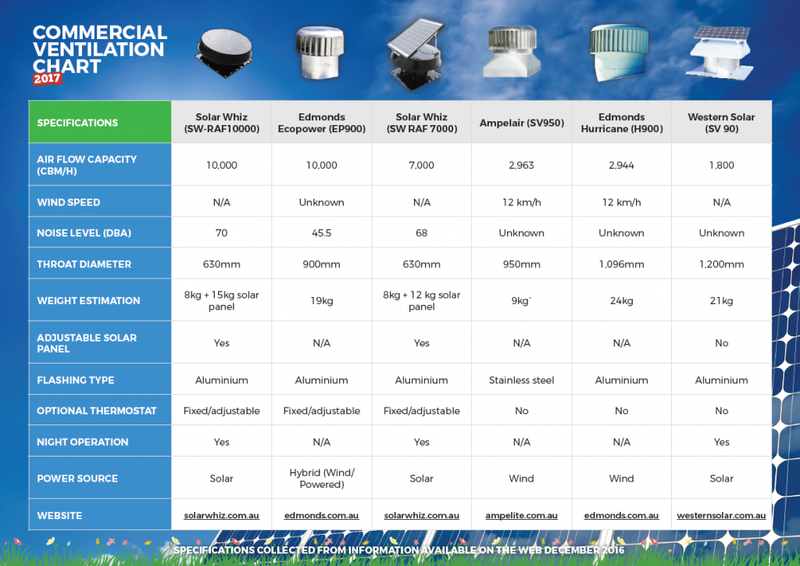 Solar and wind commercial roof ventilation both have their pros and cons, make sure to check what suits your circumstances the most. Another important factor is the noise level of the commercial exhaust fan. Noise levels are measured in dBA (decibels) and show how noisy your industrial ventilation system may be. 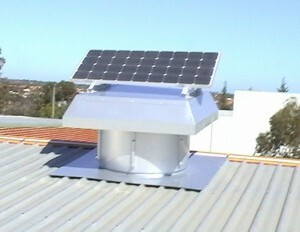 Remember that wind driven or mains powered ventilators are generally noisier than solar powered commercial exhaust fans. Lastly, the throat diameter of the commercial ventilation unit shows how large the opening is for the air to be pulled through in a unit. 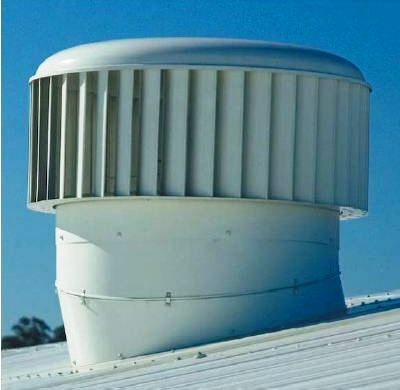 Generally a larger diameter is preferable BUT in the end, it comes down to air flow, which is the key metric which will get you the best results from your industrial ventilation. Due to prices changing and products being updated frequently we have taken the prices off our chart for 2017 but below are references for finding out the current price or getting a quote for your commercial ventilation needs. Solar Whiz SW RAF 10000 & 7000 on Live Chat. Commercial ventilation can be a big, but a worthwhile investment that can save you money in the long run. Make sure that you have all the facts to make an informed decision and if you need anymore information on commercial ventilation feel free to message us at Roof Ventilation Blog!